Stir and shake mayonnaise, sugar, wine vinegar, half & half, and poppy seeds in a jar with a lid. Refrigerate. 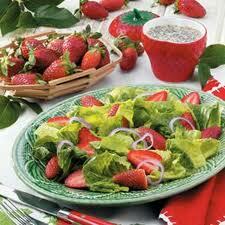 When cold and ready to serve, pour over lettuce, strawberries and red onion. *Note: This is my favorite dish that Rita makes…and she’s a great cook! It is just cool and refreshing! She serves in at their 4th of July barbeque and it is always a hit!